People enjoy the atmosphere at a Hachnasas Sefer Torah. Prominent Rabbanim are often present, many people are honored with writing a letter and the atmosphere is festive in honor of this (relatively) rare mitzvah. Yet, there are many halachic issues that often occur, causing much stress to those involved behind the scenes. And often, for days after, sofrim and poskim are still busy trying to sort these issues out. Let us have a quick look at some of the halachos involved and issues that often come up. The halachah is that someone who does not wear tefillin or is a mechalel Shabbos b’farhesya [publicly] may not write Sta”m. Unfortunately, all too often, such people are neighbors, relatives or have contributed significant sums to the project. Withholding the honor of writing a letter from them is not a simple matter. Often the buyer and sofer have an agreement, from the beginning of the Sefer Torah, regarding the immersion of the sofer in a mikveh. This may be daily or at particular intervals before writing. If the buyer would like to keep this hiddur until the very end of the Sefer Torah, this can lead to particularly awkward situations at the Hachnasas Sefer Torah. Before writing, the honoree must say “[hareini kosaiv] l’shem kedushas sefer torah.” “[I am writing] for the sake of the sanctity of a Sefer Torah.” I am familiar with situations where the honoree mistakenly said “hareini kosaiv l’shem mitzvas sefer torah.” This mistake has become the subject of many a debate within the Sta”m world. (Ultimately, the poskim are maikil). While a left-handed person may write Sta”m (although some Sephardic communities are more stringent in this issue), the Mishna Berura rules that one who performs all actions with one hand yet writes with the other, should ideally not write Sta”m. A number of prominent acharonim concur. Believe it or not, there are many such people. Someone who would like to fulfill this directive will be faced with the uncomfortable task of “investigating” each potential honoree. The fact of the matter is that the “hollow” letters customarily left by the sofer for the honorees to “fill in” are actually kosher as they are. The “filling in” of the letter by the honoree is an act that carries no halachic significance. It is well-known that HaRav Elyashiv zt”l was of the opinion that this rule has one exception. A hollow yud is not kosher. For this reason he always chose to fill in a yud when honored at a Hachnasas Sefer Torah. HaRav Chaim Kanievsky shli”ta follows this practice as well. For this reason some clients ask the sofer to leave over some “broken” letters as well. When the honoree attaches the two broken parts of the letter together with ink, the letter becomes kosher. There is a beautiful story that is important to keep in mind when contemplating the above. It should help serve as a guide for anyone “in a pickle” at a Hachnasas Sefer Torah. The Tchebiner Rav, HaRav Dov Berish Wiedenfeld zt”l once attended a Hachnasas Sefer Torah. 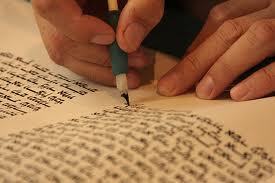 The owner of the Sefer Torah wished to honor him with writing the first letter to begin the evening. The Tchebiner Rav quickly scanned the crowd and when he sat down next to the sofer, he lifted the kulmus (quill). While handing it to the sofer, he said in a voice loud enough for all to hear, “I hereby appoint you as my shaliach to write a letter in the Sefer Torah for me.” The sofer then went ahead and filled in the letter. Obviously, when all the other guests saw how the Gadol HaDor had done it, they followed suit. The Sta”m Chronicle is reprinted here on JKN with permission from the author. Posted on December 20, 2013 by JKN Israel. This entry was posted in STaM. Bookmark the permalink. Fabulous article. Incredible information. Truly an eye-opener. I imagine most of us are completely clueless when it comes to the world of writing a Sefer Torah, and particularly all the halachot involved. I think that if I was a man [and not a Sofer STa"M] and was offered to write a letter, I would bow out. Let the Sofer, who knows all the halachah, do what he does best, l’shem shamayim u’l'shem kedushat ha’sefer torah. Yechiel, thanks so much for sharing this with us.